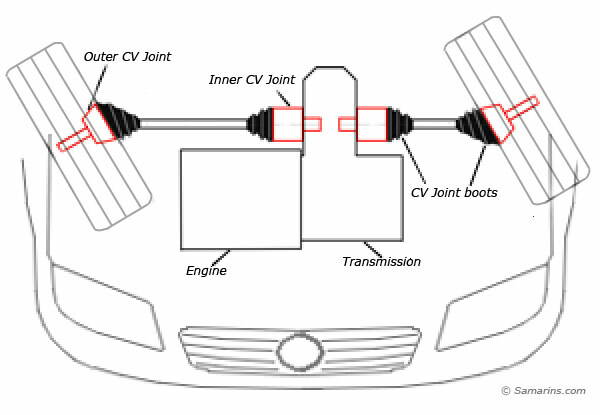 CV Joints in a front-wheel drive vehicle. 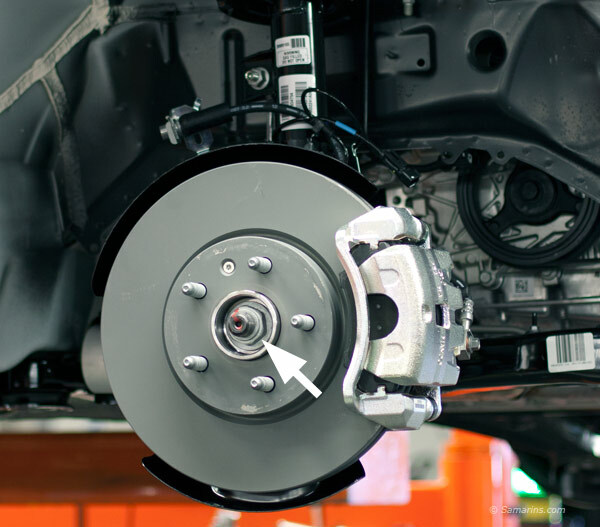 The CV joints are needed to transfer the torque from the transmission to the drive wheels at a constant speed, while accommodating the up-and-down motion of the suspension. In front-wheel drive cars, CV joints deliver the torque to the front wheels during turns. 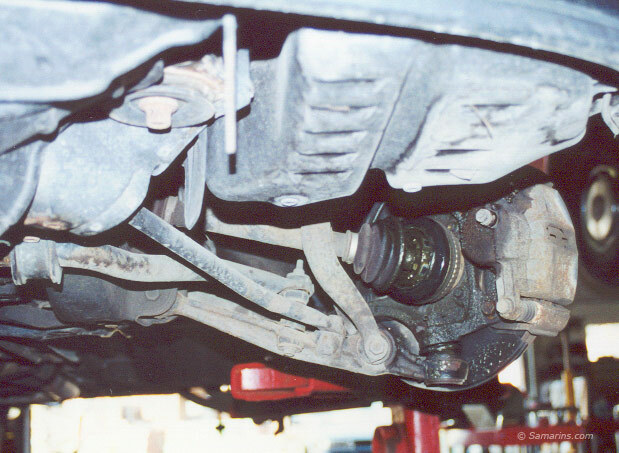 There are two most commonly used types of CV joints: a ball-type and a tripod-type. 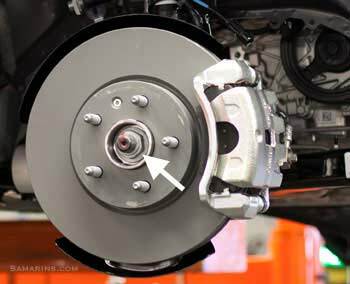 In front-wheel drive cars, ball-type CV joints are used on the outer side of the drive shafts (outer CV joints), while the tripod-type CV joints mostly used on the inner side (inner CV joints). 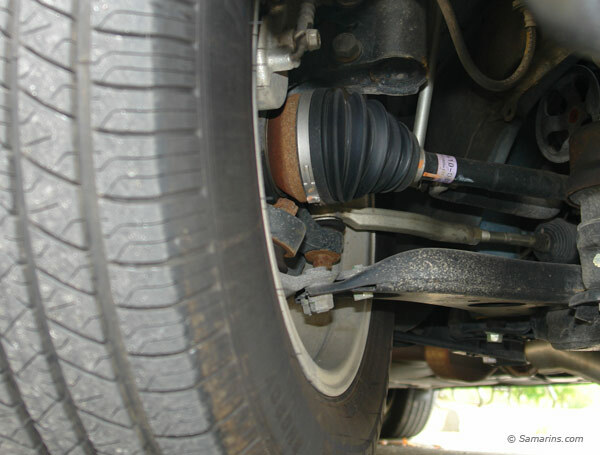 The CV joint boot looks OK.
A CV joint is packed with a special grease and sealed tight with the rubber or plastic boot, that is held in place with two clamps. A CV joint doesn’t need any maintenance and can last very long, as long as the protective CV joint boot is not damaged. It’s not uncommon to see a car with over 300,000 miles with still original CV-joints. 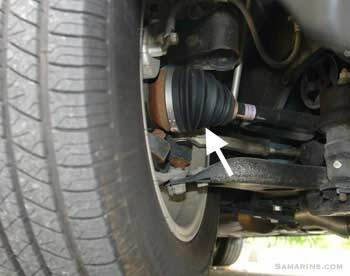 The most common problem with the CV joints is when the protective boot cracks or gets damaged. Once this happens, the grease comes out and moisture and dirt get in, causing the CV joint to wear faster and eventually fail due to lack of lubrication and corrosion. Usually outer CV-joint boots break first, as they have to endure more movement than the inner ones. CV boots are typically inspected during regular maintenance visits. Your mechanic will look for cracks, tears and other damage. Broken outer CV joint boot. Grease coming out of a small crack or tear is the early sign of the CV joint boot failing. If the damage is bigger, you might see dark grease splattered on the inside of the wheel rim and around the area inside of the drive wheel like in the photo. 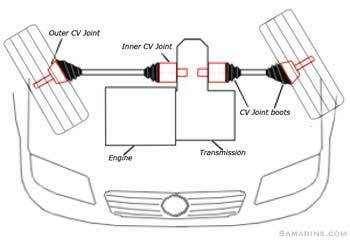 If a car is continued to be driven with a damaged CV joint boot, the CV joint will wear out and eventually fail. A most common symptom of a badly-worn outer CV joint is a clicking or popping noise when turning. Usually the noise gets louder when accelerating in turns. 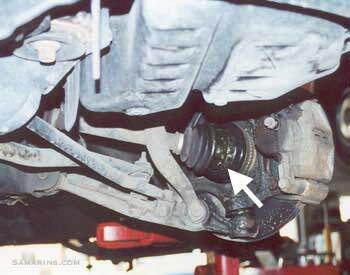 In worst cases, a badly-worn outer CV joint can even disintegrate while driving. This will make your car undriveable. If a damaged CV joint boot is caught early, simply replacing the boot and repacking the CV joint with a fresh grease is all that is usually needed. This is much cheaper than replacing the whole CV joint or drive shaft. The CV joint boot replacement costs from $180 to $350. The part is usually not very expensive, but a fair amount of labor is involved to replace it. A CV joint boot is typically sold as a kit, with a fresh grease and new clamps. If a CV joint itself is worn out, it cannot be repaired; it will have to be replaced with a new or reconditioned part. Sometimes, a CV joint does not come separately. In this case, a whole drive shaft will need to be replaced. The replacement of the drive shaft could cost from $380 to $800 in a repair shop. If you are planning to replace the CV joint boot or a drive shaft yourself, you will need a strong torque wrench (or a breaker bar) and the right size socket to break loose the main CV joint lock-nut or hub nut(in the photo) because it’s very tight. Also, be prepared that the lower ball joint will have to come out, and it could be quite difficult to do without special tools. The hub nut will also have to be re-torqued to the specified torque after the repair is completed. Check the repair manual for instructions and torque specifications.